Not sure why I am doing this to myself. After tanking in the cold challenge with a similar shot, I thought maybe I could do better in this challenge. Not sure that I even agree with my own hypothesis, but there you go. Well, looks like I was right to enter. It's amazing considering how close I was to blowing the whole challenge off! Glad I didn't. I am totally blown away by the comments and strangely high score. I wonder if it will hold through until Sunday? It's sitting at 6.65 right now with 11 comments & 2 faves. I keep having to pinch myself. Woken up to 6.96 this morning with 26 comments and 6 faves. Considering it started at 5, I cannot quite believe the steady and continuous rise in the score. I'm amazed and somewhat dumbfounded. I thank Melethia, for encouraging me to enter. if not for her, I probably would not have entered at all! I took this on my way to the forest to shoot some tree pics (none of which I was happy with). One commenter wondered if it was set up. No, definitely not, it is a group of skiers skiing on the lake outside my house. A regular sight at this time of year. Oh heck. I wasn't expecting that. I really did not think this score would bring me the blue ribbon. WOW. Thank you everyone for the votes and all those comments. Been thinking a bit about how surprised I am to see something blurry ribbon. I hope this is not the last time a blurry shot hits the front page. Sarah, I just want to say you are becoming the master of beautiful, artistic blurs as well as beautiful landscapes. I am really enjoying seeing the growth in your portfolio. You're becoming a fantastic photographer! There are plenty of ribbons ahead for you! Message edited by author 2010-06-08 12:26:30.
very nice ! sort of reminds me of something for a pink floyd cover art. would have likely done well in that challenge too. Good for you! Well deserved. Thanks everyone for the comments, it means a lot. I hope you aren't sick of being congratulated yet! Congrats on a well-earned blue ribbon. Congratulations Sarah! This is such a wonderful image and I'm so happy that it's on the front page...and also happy about the Honorable Mention from the jury. Your a Double Winner and then some. Cheers! A winner, for sure! Excellent image. Congratulations! :) Melithia convinced me to enter, also. Great fun! Message edited by author 2010-03-15 14:09:45. Congratulations. This was one of my faves in the challenge and it got a 9 from me during voting. Fully deserves the blue ribbon. This is a special blue. I'm incredibly happy for you. Great entry - and a vindication for the voting masses of dpc. Absolutely stunning! It's blurry but at the same time tack sharp. I am THRILLED that an image like this (and specifically this one) made it to the top. Go Girl - this is simply stunning. Congratulations!! probably one of the most incredible images to ever ribbon. reminds me of xion. Go you good thing! CONGRATULATIONS! Very much deserving of 1st place. I'm so happy for you! congrats on your blue, such a lovely image! This image shouted 'winner' to me as soon as I saw it - a simply stunning piece of fine art! Great shot Sarah - well deserving of a ribbon. This one was a standout for me and my top pick. Congratulations on your blue ribbon. I knew it!! Sooo happy for you, Sarah!!! Amazing! Congrats!! I bet you're over the moon. Simplicity paid off big time for you! Congrats on your new ribbon. I also like the blur in this. I'm so thrilled that a blur won the blue. WOO HOO!! Loved this during voting. Congrats. Very cool - it's all spooky and alienlike :D Congrats on the blue, Sarah! Gorgeous image. Congratulations on a very well deserved blue!!! congrats!!!! i really enjoy this image. Yay! this was my favorite. Congratulations. To me it's the simplicity, the contrast between the sky and snow, and that dark horizon that make this so wonderful. Fantastic, I didn't expect this to win! Congrats! Wow what a beauty! Excellent work. Well deserved first place, and what a fabulously arty challenge to get a blue on! Are you making prints available for this one? WOOO HOOOO!!!!!! And what a challenge to get it in! Congrats!! Vexing how the background appears blurred horiz while the apparent foreground is vertically blurry. A nice arty feel here. This does like like contemporary art. Nice job. 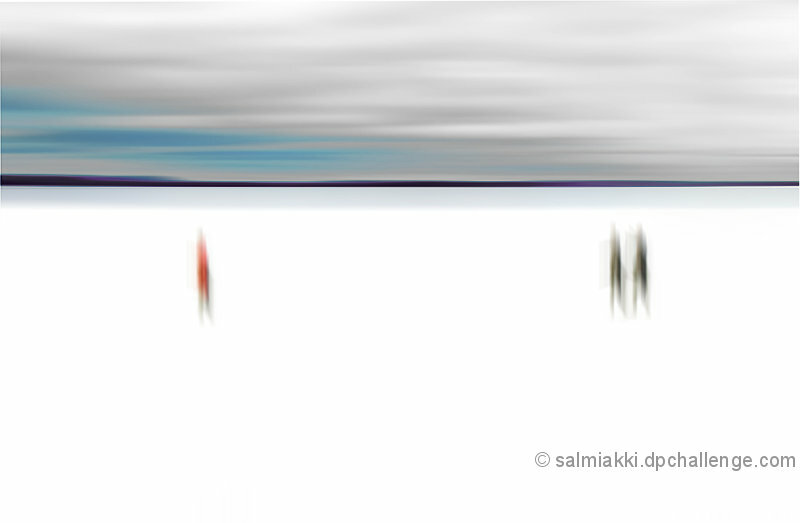 This is my favorite of the challenge: simplicity is outstanding, three abstract yet human form figures contribute a story line, red-orange of alone figure works well with cyan of sky, repeating horizontal elements of clouds and horizon elemets contrast with the upright figures, stark white background excellent, but mostly it just has a lot of appeal independent of analysis of elements. I love the blurred contrasting colors on the solid white coupled with the lines at the top. Good luck. This is the case where less is more. Simple, balance and a perfect composition. Another instant ten. Beautifully conceived -- very artisitic. We are lost in a frozen wasteland, following each other to nowhere. Nice. Grog see hunting party return. No blood on spears, no mammoth for tribe. Will have to eat Thag's tree bark casserole again. Grog is kind. Tells Thag cooking is delish. 8 - I like the uniqueness of this. In photography, I haven't seen anything similar to this (but I don't get around much these days). The simplicity and the lines and the colors and the three figures all work well and there is good balance in the composition, especially with the rise in the distant landscape on the left side with the solitary figure. The colors, while very muted, work well - if you changed any hues or adjusted the saturation, this must be your personal color wheel choice - a variation would likely have more impact for me, but this is your vision, not mine. surreal landscape. the figures are brilliant -- will be interested to learn whether you found them or set them up. either way, one of the top shots in the challenge. Spare and interesting. The horizontal/vertical movement in the clouds and the figures is intriguing. A pleasing composition. Personally, "fine art" photos are usually emotive for me, but this is rather sterile, and doesn't hit me where I live. I reserve judgement as to whether this is successful or not. I enjoy seeing the world in a different way and this one makes me smile. Well done. Very unusual pure, simple and artistic. One of my top 3. The geometry keeps me looking and I especially appreciate the dash of blue in the corner. Wonderful image. Very well done. My first 10 in this challenge, exceptional..
Oh YES! I have a vision of this hanging on a very modern, urban wall in a black and white decor. This is amazing and I love it! This is truly gorgeous, and would look great hung on any wall, anywhere. COOL BEANS. I'm afraid this might be too artsy for the average DPC voter. I hope I'm wrong. Best in show IMO. Excellent!!! One of my 10s - I love the purity / economy of the coloration and the two way blur confounds my brain - I'm inclined to guess rinac. Love the blur, I just think there is too much white in the foreground. I think if the blurred people were longer and still as skinny, then it would be much better with the amount of white in the foreground. I think this works really well for this challenge it looks like a real minimalistic painting but in this context it works for me, it would look great on my wall. Proudly hosted by Sargasso Networks. Current Server Time: 04/23/2019 06:33:49 PM EDT.